What are salt water disposal wells? The following animated video presentation is an example of a Class II Saltwater Disposal Well. Please note that saltwater well information may vary by region, local regulations and geology. Class II Saltwater Disposal Wells are the EPA’s preferred method for the disposal of saltwater produced from the oil extraction process. Saltwater is often found in the same formations as oil because it was trapped in layers of sediment millions of years ago. For every barrel of oil produced, approximately 10 barrels of saltwater are also produced and require disposal. A saltwater disposal well is most often an oil or gas well that is no longer in production. However, Class II Disposal Wells have strict requirements. States (including federally recognized tribes and U.S. territories) have the option of requesting primacy for Class II wells under either Section 1422 or 1425 of the SDWA. Under Section 1422 enhanced recovery wells may either be issued permits or be authorized by rule. Disposal wells are issued permits. The owners or operators of the wells must meet all applicable requirements, including strict construction and conversion standards and regular testing and inspection. The primary purpose of Class II Saltwater Disposal Wells is to provide an environmentally safe method for the disposal of the saltwater produced from oil and gas extraction and to protect drinking water sources. 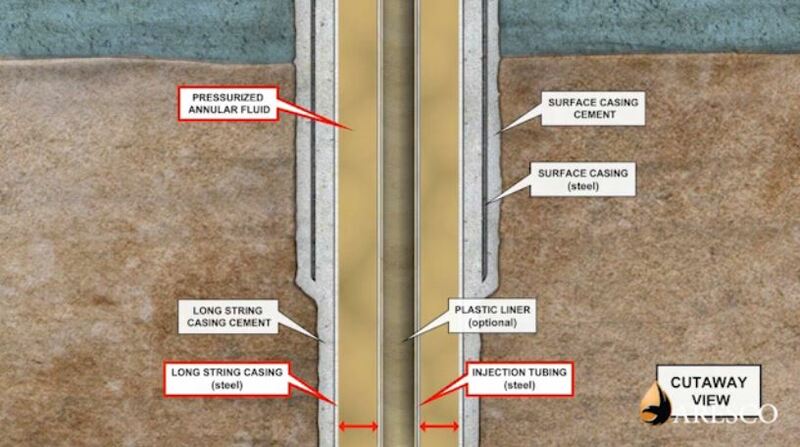 Surface casing is installed to keep any potential contamination on the surface from entering around the well. Steel casing pipe is cemented into the hole down to at least 100 feet below the water source. The above video goes into detail as to how a saltwater disposal well is constructed, utilized, and how it protects drinking water.